Dominic Adiyiah is back into the Black Stars' fray after a tough start to professional football. White tracksuit-sporting, Herve Renard-impersonating coach Patrice Carteron has ignited controversy after signing a contract with African superclub TP Mazembe despite being under contract with the Mali national team. Carteron, who has a contract with Mali that runs to August 2014, has been reported to FIFA for breach of contract by the Mali FA. Carteron has pleaded that he was not a mercenary considering the tumultuous conditions he was working in with Mali and that he had accumulated enough money as a player not to for money to be an irrelevant factor. Carteron plans to leave Mali after taking charge of next month’s qualifiers but with Les Aigles seeking sanctions against him, you can’t help but feel an impasse is due. Still, he has been allowed to name a squad for thequalifiers which has assembled in Nantes for a training camp, calling up Aston Villa’s Yacouba Sylla for the first time and recalling French Ligue 2 goal machine Mustapha Yatabare and Academica's Alphousseyni Keita. 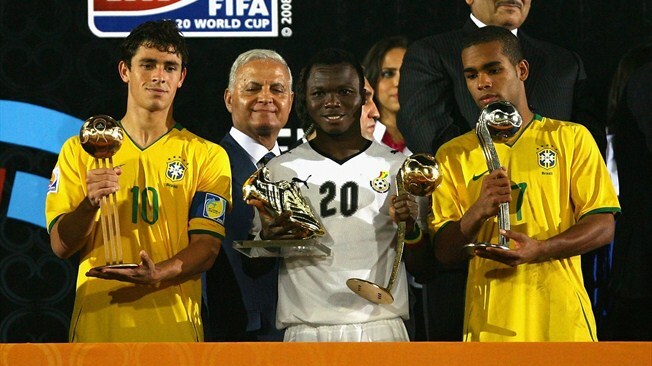 2009 U-20 World Cup Golden Ball and Golden Shoe winner Dominic Adiyiah has earned a shock recall to the Ghana national team. The 23-year-old’s career seemed to be on a freefall from the dizzying heights of the U-20 World when he scored 8 goals to guide Ghana to the U-20 World Cup gong, going from AC Milan to Arsenal…Kiev. Just when a cautionary tale titled “From Adiyiah to Ohdear” seemed impending, he has received a much-needed lifeline. Who knows, some players were just meant to be international footballers rather than club footballers; after all, there has been plenty of African footballers that have thrived more in country colours than club colours. Buccaneering right-back Samuel Inkoom also returns after missing out at Afcon while lofty centre-back Rashid Sumaila is included for the first time. In the Ivorian camp, the major news still remains that Didier Drogba has not been recalled despite showing an upturn in form as he helped Galatasaray clinch the Turkish title. Kolo Toure and Emmanuel Eboue also miss out due to criticising the Ivorian FA whilst Siaka Tiene remains on the sidelines due to a lack of first-team football at PSG. In contrast, there are recalls for Seydou Doumbia, Romaric and Jean-Jacques Gosso, one of the standout players at Afcon 2012 but who had to miss Afcon 2013 due to being unattached. There are first call-ups for Toulouse’s highly-rated Serge Aurier and Mathis Bolly of Fortuna Dusseldorf. Aurier, who is comfortable across the backline, had been mooted for a call-up but had dithered as he pondered over France and the Ivory Coast. His call-up is a huge boost for an ageing Ivorian defence. In other squad news, Togo have called up the defiant duo of Emmanuel Adebayor and Kossi Agassa but will have to play the waiting game as they didn’t answer the call to the Cameroon match in Yaounde. Morocco have recalled Younes Belhanda, Ahmed Kantari, Abderrazak Hamdallah, Abdelhamid El Kaoutari and captain Adil Hermach for their must-win ties against Tanzania and Gambia. Senegal coach Alain Giresse has dropped Demba Ba after a disappointing performance against Angola in March but a formidable strikeforce still sees him have Papiss Cisse, Dame N’Doye and Mame Biram Diouf at his disposal. Zambia coach Herve Renard, meanwhile, has named 10 local players in his 25-man squad, the highest number in over 5 years – a strong indication the French father figure is losing patience with the lack of form ubiquitous in the squad. Recently-crowned Tanzania champions Young Africans have re-signed mercurial winger Mrisho Ngassa from archrivals Simba. Ngassa, who was handed a Young Africans shirt and raised aloft in the recent Dar es Salaam derby/Tanzanian Classico, in which Young Africans recorded a 2-1 win, insisted that his transfer to Simba was only a loan move and that Young Africans were always the club at the forefront of his affections. There are also growing rumours that Young Africans are on the brink of signing the aptly-named Tanzania national team midfielder Amri Kiemba – ‘Amri’ means ‘Command’ in Swahili – from their archrivals. Cameroon have named German Volker Finke as their new coach, emitting a huge collective sigh of relief from African cynics. Former France coach Raymond Domenech, also known as Monsieur Mystic, had been the favourite to take over the post. African juju and astrology wouldn’t have been a good mix would it? With German football de rigueur, Finke possessing a 16-year stint as manager of Freiburg, and Cameroon in dire need of some – any – sort of competence, the Cameroon FA maybe, just maybe, have finally made a shrewd appointment. Uganda have also filled their vacant managerial hot seat with the appointment of Milutin ‘Micho’ Sredojevic. The Cranes had surprisingly sacked Bobby Williamson last month and have replaced him with Sredojevic who was axed by Rwanda earlier this year. The Serb boasts a successful three-year stint in the Uganda league side SC Villa and was behind the project that produced that produced a core of players that have served Uganda well over the years.